Not every city that switched to district-only elections ended up electing more Latino candidates, independents are gaining influence in North County and more. Coastal North County has long been a safe space for conservatives. It’s now home to a Democratic congressman and assemblywoman who capitalized on national angst and shifting demographics to build an unprecedented base of support. Republicans failed this year to even get through the 76th Assembly primary and then abandoned Diane Harkey, their pick for the 49th Congressional District. As the sun rose Wednesday, Democrat Mike Levin was leading by 5 percentage points and poised to head to Washington, D.C.
Rather than simply pay his respects to the protesters who helped convince Rep. Darrell Issa to forgo re-election, Levin folded them into his campaign. But the 49th wasn’t necessarily about Levin or Harkey. It was about President Donald Trump. In the days leading up to the election, he stoked fears of asylum-seekers arriving at the U.S.-Mexico border and spoke of eliminating birthright citizenship. Voter after voter in coastal North County told me Tuesday that they wanted to send the president and other federal lawmakers a message. One man said the country wasn’t designed for single-party rule and the House needed to live up to its role as a check on executive power. Yet the energy radiating from Levin’s campaign did not trickle down to the local elections in any clear and consistent way. Still, activists hope they’ve laid down the necessary infrastructure to keep Democrats competitive for years to come — looking to the nation’s capital for inspiration. “In a morbid way, a lot of people see themselves as able to make a difference now,” said Kyle Bright, a MiraCosta College student and president of the North County Young Democrats. Democrats held onto or won all three of the available seats on the Encinitas City Council. But they lost the Fifth District county supervisor’s race by double digits. And they got stopped at the gates in Vista and Carlsbad for the most part, despite the energetic campaign for mayor waged by Cori Schumacher, who rallied neighbors in 2016 to kill a luxury shopping mall on the Agua Hedionda Lagoon. She went on to win a seat on the Carlsbad City Council as its only Democrat. Incumbent Republican mayor Matt Hall seemed anxious at the final forum two weeks ago, and his campaign consultant told me going into Election Day that they were “cautiously optimistic.” In the end, Hall won by 13 points. Skepticism over development played well in certain parts of North County. In others, it didn’t seem to be the defining factor of the race. Schumacher, for instance, speaks often of smart growth and the need to plan better, respecting the voices of the community. At the same time, she’s stressed the importance of public transportation as a way to alleviate traffic while building socioeconomic equity. In March, she voted against a proposed four-story, mixed-use building in downtown Carlsbad after residents complained about its size and look. “We need to be transit-first, not density-first,” Schumacher said at a forum in October. Developers spent almost exclusively on North County Republican candidates this year, pumping thousands of dollars into the San Marco City Council race and others, according to the Coast News. One of their targets was Randy Walton, a Democratic school board member who’s aligned himself with another San Marcos councilman, the lone official to vote no on the 189-home Highlands project. So out-of-town builders mailed a hit piece around town. “They don’t drive our roads. They don’t have kids in our schools. They simply want to build their houses and take their profits,” Walton said in a Facebook video. He beat two challengers by significant margins. 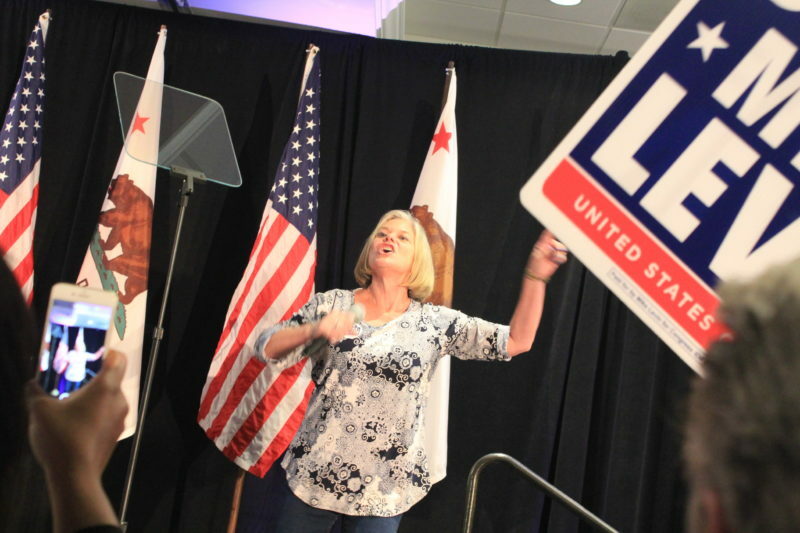 That tension was reflected in the San Diego County Democratic Party’s endorsements. Officials couldn’t bring themselves to take a position on Oceanside’s slow-growth initiative, which was intended to preserve agricultural land. But they did urge National City residents to vote yes on a rent control measure and on an Encinitas proposal that would allow for greater density in some parts of the city. So What About Those New District Elections? Six cities in North County made the switch this year to district-based elections and again, the results were mixed. But there were a couple notable victories for Latino candidates. In Escondido, where district elections were established in 2013, a young community organizer, Consuelo Martinez, ousted longtime Councilman Ed Gallo, who’s white. According to the U-T, the district was drawn to give Latinos a majority, and Martinez campaigned on being able to speak the language of her neighbors and engage them civically. In Oceanside, Esther Sanchez, an attorney, pulled ahead of Chuck Lowery, a retired businessman, on Wednesday. Both are Democrats and both are sitting Council members who were forced to compete against each other after the new electoral lines were drawn. Municipalities across California have been forced in recent years to change the way they elect local politicians. That’s thanks almost single-handedly to a Malibu attorney who has successfully used the California Voting Rights Act to argue that Latinos are being disenfranchised in places with majority-white representation. Rather than risk millions of taxpayer dollars fighting the lawsuits, many cities have attempted to satisfy state law by carving the electoral map into districts rather than continuing to require candidates to run citywide. By and large, district-based elections have yet to live up to the big promises made by supporters. Last year, the Los Angeles Times found that only seven of the 22 cities that had made the switch had seen an overall gain in minority Council members. In September, the Union-Tribune looked at school districts that had also made the change and came to a similar conclusion, noting a shortage of new candidates. About half of the school board races in San Diego County were uncontested. Proponents of the district-based system say the fruits of their legal labor will be revealed in time. If you want a visual sense of how the voter registration rolls have changed throughout the region in the last decade, check out this U-T graphic. It shows that significant parts of Oceanside, Vista and San Marcos have gone from Republican to Democrat. What’s even more startling is that independents are now the dominant force in northern San Diego, wedged between Carmel Valley and Rancho Bernardo. The ZIP code with the highest number of independents — more than 50 percent — falls in Camp Pendleton. Vista residents were given two options to regulate marijuana businesses on Tuesday, and they went with the one written by activists and industry professionals. Measure Z allows up to 11 medical marijuana retailers and imposes a 7 percent use tax on their gross receipts. Turned off by that proposal, City Council members put forth their own, which would have barred storefronts and limited medical marijuana sales to deliveries and given the greenlight to two testing labs. That was Measure BB. The passage of any marijuana ballot measure represented a big shift in a city that has aggressively cracked down on illegal sales. Days before voters went to the polls, Vista’s city attorney hit the proponents Measure Z with a campaign finance complaint. Members of the Del Mar City Council are not happy about a pro-marijuana festival slated on the fairgrounds for 4/20 of next year. Councilman Terry Sinnott questioned whether the event was truly “educational,” as it claimed, and wanted to invite public health officials to speak on the dangers of marijuana. Carlsbad announced last week that it hired David Graham to become the city’s first chief innovation officer. Now a deputy chief operating officer in San Diego, Graham oversees everything from housing reforms to the Climate Action Plan. Later this month, he’ll begin reporting to Carlsbad City Manager Scott Chadwick, another San Diego ex-pat who previously served as that city’s chief operating officer. During his time in San Diego, Graham drew national attention for his work to help the city step up its use of so-called smart technologies. Those efforts were profiled last month in a “CBS This Morning” segment. Graham’s new role will focus on civic engagement, sustainability and ways to use data and technology to improve city operations. He’ll be tasked with finding ways to get more resident input on city services and projects, including a new City Hall, and he plans to launch a program to support entrepreneurship and start-ups in the city early next year. Graham and Chadwick say that Carlsbad’s status as a mid-sized city, home to multiple tech companies, make it particularly suited to test out new technologies and spread what they learn elsewhere. Graham is also poised to play a key role in conversations with neighboring cities about teaming up to purchase energy. “I think of (Carlsbad) as a sandbox of innovation,” said Graham, who will be paid $185,000 annually in his new role. A Del Mar ballot measure that would have effectively limited the size of some beachfront properties was defeated with dictatorial numbers. About 85 percent of voters cast the equivalent of “get out of here.” As I wrote in October, even the author of the initiative had turned against it.